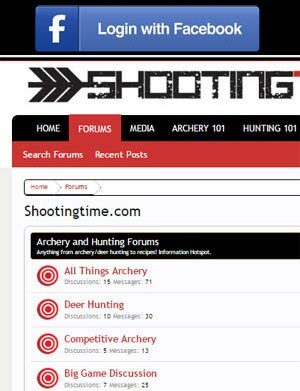 The turkey hunting tips you’ll read in this article are the result of many years of my turkey hunting experience as well as others on the shootingtime.com staff. Use them to guide your moves this spring and fall and your turkey hunting success should skyrocket! Here is a little story on how I started turkey hunting. I was introduced to hunting at a very young age, and turkey hunting was my first taste. I remember it like it was yesterday. I wasn’t old enough to carry a gun yet but my Dad had a tag and I had been begging him to take me along. We got up really early and were heading into the woods well before daylight. We had walked several hundred yards in the pitch black before my Dad stopped on the edge of a clearing and reached into his vest for his owl hooter. After a couple of minutes of silence, my dad sounded off with the owl hooter. The woods erupted. I still recall the bone chills that went through me when the birds began to scream. It was at that very moment that I became a turkey hunter. The author’s friend Frank- a military veteran with his first turkey by using the turkey reap method. Turkey hunting can be the easiest sport in the world and it can also be one of the hardest. A lot of that can simply depend on the attitude of the turkeys that day. No matter how good of property you have, and how good you call turkey, some days the birds just aren’t going to want to play the game. On the flipside, the most inexperienced turkey caller can go to the woods and make awful sounds with a call and the birds might come running in on a string. That is what makes turkey hunting so addicting; you never know what you are getting yourself into until you are into it. 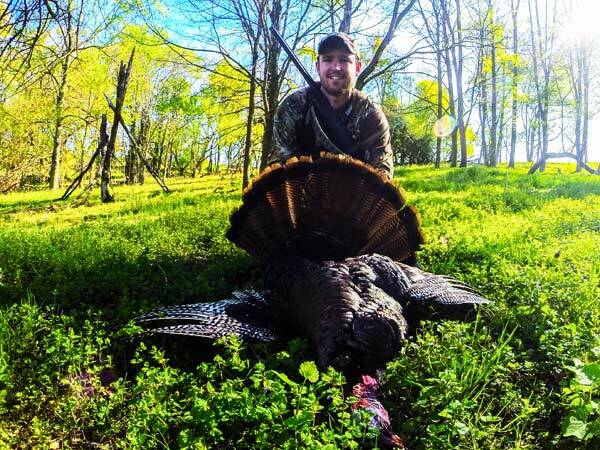 That being said, there are still several turkey hunting tips you can abide by that will increase your chances and stack the odds in your favor for consistent success in the spring turkey woods. Here is a collection of turkey hunting tips that will help you in this upcoming season. Experience and trial and error trump almost anything you find on the internet, but these tips will save you some time in your pursuit for America’s favorite game bird. In order to be a successful turkey hunter, you have to hunt where the turkey are, or in most cases, where they want to be. Unlike deer hunting, permission on private ground comes a little bit easier this time of year (spring). Most landowners, or at least the ones that aren’t serious about turkey hunting, will allow you permission to access their ground in the spring to chase birds. No better time of the year to spend your mornings driving the backroads to locate a group of gobblers. Turkeys are very visible in the spring. The males are trying to win over the courtship of the hens and in order to do so they like to get out in the open and strut their stuff. This is an excellent time to find out when and where they are putting on their mating displays. If you’re not having luck laying eyes on them, sometimes all it takes is pulling off the side of the road and listening for a period of time. Very often, you’ll be able you’ll hear them gobbling and if you don’t, you can try a turkey locator call like a crow call or an owl hoot to drum up a response. If you get an answer to one of your turkey locator calls, you now have a direction to concentrate your efforts on. I would say that 90% of turkey get shot in an open clearing or field. Clearings are ideal because turkey rely very heavily on their keen vision. Turkey like to be in the open because it not only allows the males to display themselves during the spring breeding season, but it also allows them to see approaching predators. Fields are a great place to set up, particularly if you are hunting with turkey decoys. If you’re hunting out of a ground blind, you can pop it up almost anywhere, even in the middle of a field in some circumstances. Unlike deer, turkey don’t seem to be bothered by a ground blind that is freshly popped up, especially when there are turkey decoys in front of it. If you’re not hunting out of a ground blind, find a comfortable spot on the edge of the clearing, big enough to break up your outline from the birds that enter the field. It is also important that you have clear shooting lanes out into the field where you expect the birds to be. Turkey can be easily patterned this time of year. This is where the preseason scouting really pays off. You may find a field that turkey are regularly visiting mid morning or late afternoon. By knowing what times the turkeys are using a field, you can carefully set up well before their arrival for optimum success. Fields aren’t the only way to hunt, however. 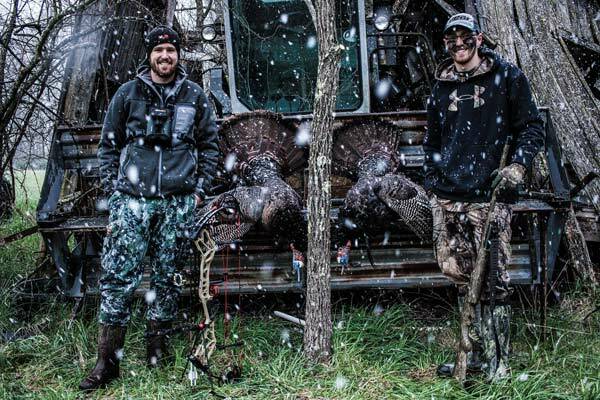 If the area has moderate to heavy turkey hunting pressure, sometime you have to go to birds. Timber hunts can be very effective as well and a lot of fun when they work. If you are hunting hilly wooded terrain, you can have had luck calling birds both up hills and down. I have had way more success calling them up a hill to a set up. If it is thick timber, a lot of time, I will not even use a decoy. The birds have the ability to pinpoint where your call is coming from, so once they get within 75-100 yards I quit calling. By not calling once they are getting close, I almost eliminate the chance of getting busted by their crazy senses of sight and hearing. I suggest not using decoys in thick timber simply because I have had them surprise birds and spook them way more times that not. If you are hunting in more of an open timber, a decoy can still be very effective. Again, there are some things you must learn from trial and error. The most common method of turkey hunting is referred to as “run and gun” which just means you’re mobile as needed. For example, if you hear a bird gobble several hundred yards away you can easily pick up or decoys and get closer if needed. In addition, this method is often used to cover long distances by trying to locate a gobbler by walking, stopping and calling until you hear a gobbler sound off. I typically will only carry one decoy, either a hen or a Jake which I may or may not set up depending on the situation. Be sure to get up against a good sized tree for cover. 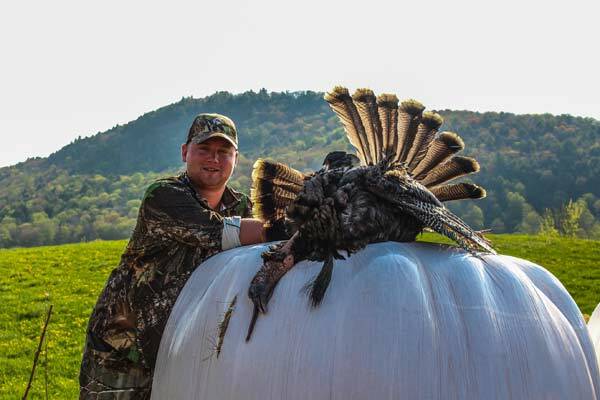 Authors hunting partner and co-owner of Prodigy Outdoors- Cody Hesseltine shot this big long beard while visiting his parents in northern New York while using the run & gun method. The second method is what we often call “Deer hunting” them which is more stationary and/ or from a ground blind. 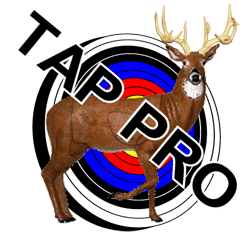 This is favored when the weather is inclement, hunting small tracts, bowhunting, filming or introducing a new hunter. When there is rain or wind the turkey, senses are reduced so they often go to fields and aren’t as vocal typically. 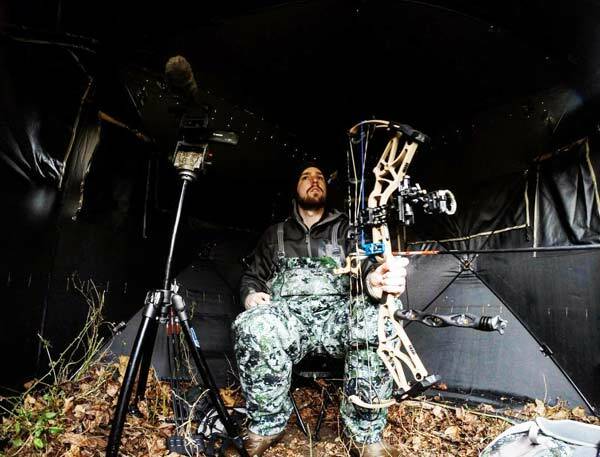 Authors hunting partner and co-owner of Prodigy Outdoors- Cody Hesseltine staying warm and comfortable in the ground blind during a cold and snowy opening day in Virginia. I have found that setting up in a ground blind and waiting them out and allowing them to work their way into range to be most effective. Trying to draw on a single turkey without a blind is difficult in itself but with multiple birds it’s almost impossible. A ground blind allows you to move and draw/ raise your gun easily, and successfully so you can make a good shot. Turkey don’t perceive ground blinds as a threat which makes ground blind hunting great because you can sit in comfort, not have to be as worried about movement and do not need to set the blind up prior to hunting it. I often set blinds in the open field and off a field edge 30-40 yards facing the woods with my decoys 5-10 yards in front. This typically results in birds still in range even if they do not commit to the decoys. I also often can bring a shotgun in the blind in case I am not able to get drawn or the birds are out of my comfortable bow distance. Turkey reaping has evolved and become popular amongst turkey hunters over the last few years. This method involves using a strutting tom decoy to hide the hunter and creeping towards a gobbler in the hopes that he will come into to assert his dominance or at least allow the hunter to get within range. This method although Is exciting can be dangerous on public and should be used cautiously. Please watch this video to become aware of the dangers associated with reaping or fanning turkeys.